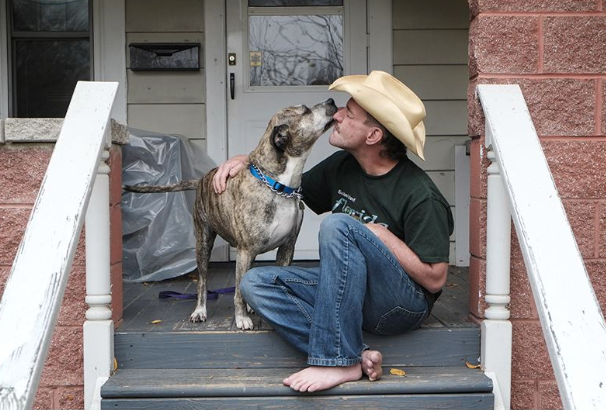 When Todd Kibbey collapsed on the porch of his home because of a heart problem, his ten year old dog Tiger didn't waste any time; the pit bull - boxer mix went to get help. Tiger ended up with Tami Michalak, who found Mr Kibbey's address and phone number on Tiger's collar. She tried calling, but no one answered, so she put Tiger on a leash and headed in the direction for Tiger's home. The large dog tugged all the way, and was clearly in a hurry to get back. According to the Toledo Blade, Mr Kibbey remembers nothing from being on the porch of his home to waking up in a hospital. Tiger was once rescued as a puppy in the Florida Everglade's, and his own act of heroics has not gone unnoticed. He will receive a Heroic Mutt Award from PETA that includes dog treats, a toy, a framed certificate, and a special harness to make walks comfortable. Only a handful of these awards are given out in a year.